These performance boots can get you through the toughest winter conditions…and you won’t want to take them off when the adventure is over. Pair it with: We fell in love with Icebreaker’s merino Aurora Zip for its old-school-ski-sweater style and thoughtful functionality (the flattering fit, thumb loops, and a media cord loop in the pocket are nice touches). Shown here with Icebreaker’s super cozy Villa Legging. Pair it with: One of our new favorites: Horny Toad’s PrimaLoft insulated Cloudcover Skirt, made with an eco-friendly, 100% recycled polyester shell. Winter dog walks or coffee shop runs have never been so cozy. If you like this, you’ll also want to check out Isis’ take on a softshell skirt: the Lindsay Skirt. This boot pulls out all the stops when it comes to pure, unadulterated comfort. Pair it with: No après adventure will be complete without Horny Toad’s Dresspass Dress, made with 100-percent organic cotton. They’ve basically taken your favorite comfy sweatshirt and transformed it into the perfect winter dress. The hood, hand pockets and flattering cut make this one of our favorite cold weather picks. Shown here with Horny Toad’s Leap Legging. Honorable Mention: If you’re into super opulent après boots, let us direct you to the motherload. Visit tecnicausa.com to find over-the-top luxury boots like the Yaghi III and Creek Fur III. We found these elegant leather boots to be as suitable for a nor’easter as they are for the fashionable city streets. Pair it with: Moving Comfort’s Flex Hoodie is an ideal layering piece for cold weather running or Nordic skiing (it features odor resistant material, thumb loops and a fitted hood), and is comfy enough to double as part of your après outfit. Here we’ve paired it with Icebreaker’s Villa Legging. What would a winter après boot be if it didn’t keep your paws toasty? We loved how these boots were like a soft, warm blanket for your feet. Pair it with: The ideal post-yoga winter clothing: the Tadasana Wrap-Ture Tunic from The North Face. We love the asymmetrical-zip design, thumb loops, and hood. Shown here with Horny Toad’s Leap Legging. Honorable Mention: Although we couldn’t get a sample in time for this story, an après boot review wouldn’t be complete without mentioning Columbia’s Minx Electric WP. Columbia uses their customary Omni-Heat reflective lining and combines it with 200 grams of insulation, plus adjustable battery-powered heat to give your feet an unparalleled pampering. Throw in the waterproof nylon upper and grippy rubber outsole and you’ve got yourself the ultimate winter boot. We just thought these boots were too awesome to ignore. Pair it with: Horny Toad’s Surpass Jacket (made with 100% organic cotton) and Leap Legging are so comfy you’ll feel like you’re in your (very tasteful) PJs all day; we couldn’t think of anything we’d rather slip on after a long day on the slopes. The Chugalug is also shown here with Prana’s fair trade certified, organic cotton blend Kaya Sweater Dress. 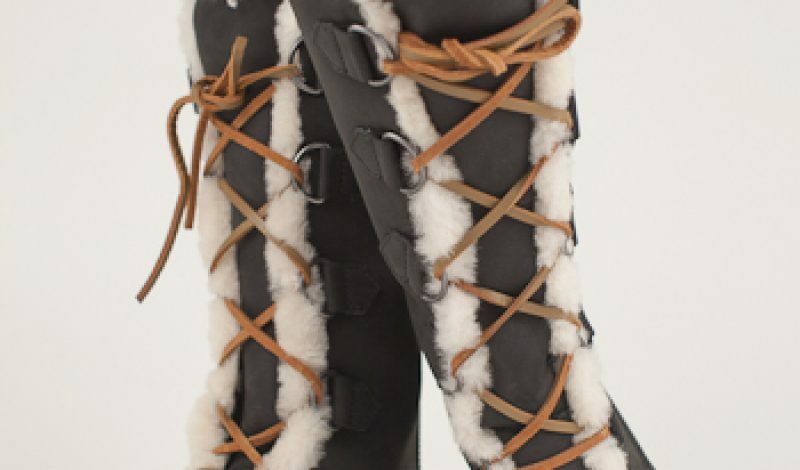 Honorable Mention: Sorel has such an extensive selection of sweet winter boots that we had a hard time choosing which pair to feature. For the more adventurous at heart, we suggest taking a peek at the Conquest Carly. If you’re more of a cold weather fashionista, we also love the Crazy Cable Wedge.